On this page, you will find our past newsletters on the topic of news and opinions from the appraisal industry. Be sure to check this page often for updates, or subscribe to our newsletter for other kinds of helpful articles. Whether you are a lender, a buyer, or a seller, you need to know which areas are thriving and which areas are dying. In this month's newsletter, you'll find the facts on both. The maps below show the percentage change in population from 2010 to 2017 per county, in Missouri, Illinois, and Iowa. The data was provided by the US Census Bureau, and I made the maps. It might just be us, but we find data interesting. I guess to be an appraiser it takes some inner-nerd. Have a look at the maps and find the county you live and work in. Are the results surprising? However, some of these population changes are fairly small. For that reason, I have also provided another set of maps below showing only counties that had an increase or decrease in population of 3% or above. In addition to this state-based data, I also have information on national population levels. Per the USDA, the number of people living in rural areas was 46 Million in 2016, which is 14% of all U.S. residents spread across 72% of the Nation’s land area. They define rural areas as “non-metro”, which are counties outside the commuting zones of cities of 50,000 or more. From the mid-1990s to 2016, rural counties have had lower population growth than metro/urban counties. 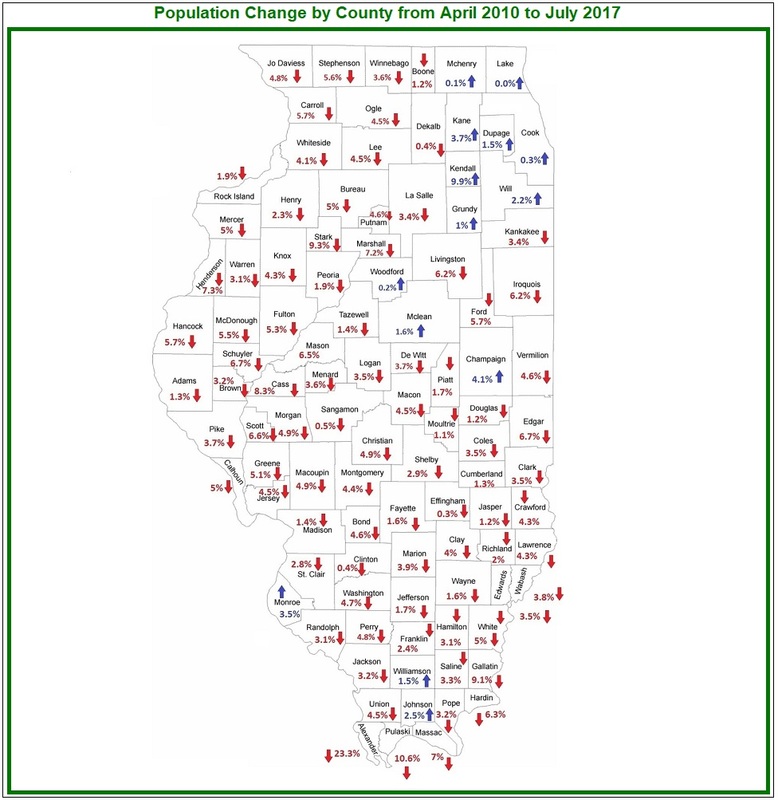 Measuring county population change includes two components: natural change (number of births vs deaths) and net migration (number of people moving in vs moving out). Natural change has been trending down gradually over time, while net migration rates can fluctuate depending on economic conditions. For many years in the rural areas, decreases in population growth due to natural change has been offset by net migration. Since about 2011, total rural population change has been negative. This is the first period that the rural areas saw overall population decline. As seen in the chart below, rural areas are nearing a point where there will be more deaths than births and where net migration is neutral or negative. Rural counties may be losing population but urban counties are growing. Suburban counties have seen substantial increases in population. For instance, in Missouri, counties with suburban areas northwest of St. Louis County have seen increases of 6-10%; counties containing Springfield and Branson have seen increases of 5-10%; in Iowa, the counties containing Des Moines and surrounding suburban areas have seen as much as 9-32% increases in population; and the counties containing Cedar Rapids and Iowa City have seen increases of 6-14%. Population changes are sure to affect real estate demand and activity in general. Are these changes evident in your area? What are you seeing in your county? We’d love to hear from you.